This month we welcome Aprons cook Teresa Rodriguez to the honorary list of Mr. George Gold Coin recipients. Teresa’s story comes to us from Sandy Springs, Georgia where she was given the opportunity to help a customer in need and change this customer’s life forever. If you need a recap of the history behind the Mr. George Gold Coin, or if you’d like to take a look at some of the past Gold Coin stories, check out this page on our blog! Teresa is described as a passionate, hardworking associate who loves to use Aprons recipes to make long lasting impressions on the customers who come to visit her at the Aprons counter. She explained that the most satisfying part about her job is seeing customers’ facial expressions when they try a taste of what she’s prepared. 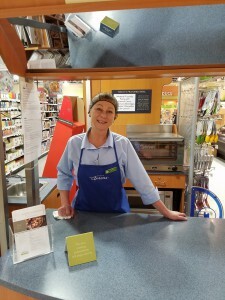 Teresa likes to think of everyone who shops at Publix as a guest in her own home, and finds thorough enjoyment in knowing that their taste buds are satisfied. Aside from seeing instant satisfaction from our taste testers, Teresa said she also loves seeing the excitement on customers’ faces when they return to share stories about how much the family enjoyed their meal. During our chat, Teresa told us that working for Publix feels like being on a winning team that’s unstoppable. Thinking of her fellow associates as a second family, Teresa looks forward to seeing them just as much as she does our customers. She went on to tell us how she and her fellow associates enjoy participating in activities together outside of work such as going on canoeing adventures and of course, having pot lucks! She attributes much of Publix’s success to its associates and how genuinely happy they are to come to work each and every day. Happy associates make happy customers and happy customers prove that shopping at Publix is truly a pleasure. It was Thursday afternoon and Thanksgiving was officially one week away. Teresa was at the Aprons counter preparing a recipe to share with customers, just as she did every day, when she spotted a sad face in the distance. Once at the counter, Teresa asked the woman if everything was okay. It was obvious that she was trying to fight back tears just by the look of how hard she was biting down on her lip. Ultimately, the tears began to fall and Teresa knew something was wrong. The customer explained that her husband had recently passed away and she was now living in a motel. What made things worse was that her family was hosting Thanksgiving and asked that she bring the stuffing. She told Teresa that the reason she was given the simple task of bringing the stuffing was because she wasn’t the best cook. At that very moment, Teresa saw the opportunity to help the woman shine. She told her, “Lucky for you, I know of a great sausage stuffing recipe that’s sure to knock the family’s socks off, and it’s so easy to make.” She then helped her gather the items needed for the recipe and told her everything would be awesome. At a later date, the woman returned to the store grinning from ear to ear. She told Teresa that the stuffing was a HUGE hit and that everyone asked her for a copy of the recipe. She then said that her dad enjoyed it so much, he even told her she should become a chef. Because of how happy it made her feel during such a difficult time to see everyone enjoy her dish, she decided to do exactly that! At fifty plus years old, she went back to college and graduated from culinary school as a prep chef. Since then, she’s received multiple job offers and says that she owes all of her thanks to Teresa. Kudos to Teresa for truly going above and beyond and for taking the time to teach her customers how to whip up some delicious recipes. We look forward to seeing what she brings to the table in the years to come. Have you ever witnessed an associate truly going above and beyond at your local Publix? Share your story with us on Facebook, Twitter, via our Contact Us page, or give our Customer Care team a call at (800) 242-1227. When Chris M. is writing his blogs, you’ll find him sipping on Starbucks iced coffee and munching on his favorite Publix brand product – the peanut butter pretzels from our Produce department! His favorite holiday is Thanksgiving, because he loves being together with family, surrounded by delicious food. Joining the Publix team at just 14 in 2006, Chris enjoys taking the love that has grown for his company over the years and using it to share interesting stories you may not already know about Publix. All in all, Chris is a huge people person and loves spending time with friends – he knows there’s always adventure to be found together!